Vidgets now supports Apple Watch, get Vidgets for Apple Watch and checkout these bite-sized widgets on your Apple Watch. Get Vidgets for all things widget, a super handy tool that changes your lifestyle! Instead of multiple taps and digging around, heaps of things can now be done with only ONE TAP or even less. Watch our half-minute video clip to have a quick idea! 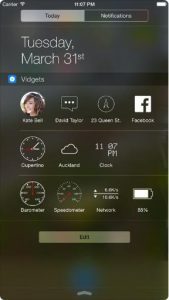 Vidgets features over 50 widgets for iOS, that you can customize and access right within your Notification Centre and Apple Watch. Full iPhone 6, iPhone 6 Plus, Apple Watch support, with Retina HD graphics, guarantees the best possible visual experiences. Vidgets is a truly FREE app, without any annoying banner ad. If you like Vidgets, you could support us by buying the Pro pack with extra neat features through in-app purchase. Email, Message, Call or FaceTime your contacts right from notification centre. Choose from over 50,000 supported apps with automatic app discovery. List of popular app launchers ready for use (Facebook, Twitter and more) with elegant matching designs. Launch your favourite app within one tap. Quick GPS navigation, quick bookmark. System Network Download / Upload Speed, Mobile Speed, WIFI Speed. Analog Barometer, Digital Barometer (Requires iPhone 6 or iPhone 6+). Battery, storage, CPU and memory usages. Analog Speedometer, Digital Speedometer, Altimeter, Compass. Separator and Spacer for layout fine tune. Current weather condition, Forecast, Temperatures of your chosen locations, Sunrise time, Sunset time. Request us to add any new widget within the app, if your desired ones are not included yet.We’ve fulfilled most of our popular requests.